The Raspberry Pi’s main mission is to educate kids, but the Pi’s proven its usefulness outside of the classroom. A Pi can be turned into a retro gaming console, a media center, a print server, and even a web server. It’s versatile, it’s small, and with the right case, it’s rugged. That’s what makes a Raspberry Pi the perfect tool for any outdoor projects you’re looking to build. Each of these projects can be powered using a battery, solar panel, or both (if you want to keep your batteries charged). Let’s talk through each of them. Thanks to the Pi’s camera add-on module, it’s pretty easy to build an outdoor camera system with a Raspberry Pi. You can even build a motion camera system if you’re looking to save on power and storage, especially with a battery or solar-powered build. You don’t necessarily need the camera add-on for this, either, as any Linux-supported USB webcam should do the job. A project like this could be used for security to monitor for intruders, or for more enjoyable purposes, like a live-streaming camera of your garden wildlife. Sustainable living is great if you’ve got the time to invest. Thanks to the Pi-powered, open source project FarmBot, you can automate the process and build an automated farm in your own backyard instead. You can buy the kit with everything you need already included or you can purchase, print and build everything you need separately. A Raspberry Pi and Arduino microcontroller controls the kit, but there’ll be additional hardware for you to purchase or build. The FarmBot project suggests you could save $700 a year on the cost of veg and recoup your investment cost within four years (or less, if you design and build your own kit). If you’re looking to eat better and save cash, this might be the project for you. With a waterproof case, the Pi makes for a good DIY remotely operated underwater vehicle—in layman terms, an unmanned submarine. While the OpenROV project sells its own DIY submarine kits, you can build your own Pi ROV using their open-source platform, available for download on the OpenROV GitHub repository. You’ll need a Pi, tether, motors, and propeller, as well as an ROV control board to build a project like this. With the Pi In The Sky add-on kit and a helium balloon, your Raspberry Pi can be sent into near space to take pictures or live stream video. Turning your Pi into a high altitude balloon shouldn’t cost the earth, thanks to the low cost of the Raspberry Pi itself and the (reasonably) low cost of helium for your launch. You will need some additional kit for tracking and for taking pictures, like the Pi camera add-on. You’ll also need tracking equipment, such as a laptop with an RTL-SDR adapter. 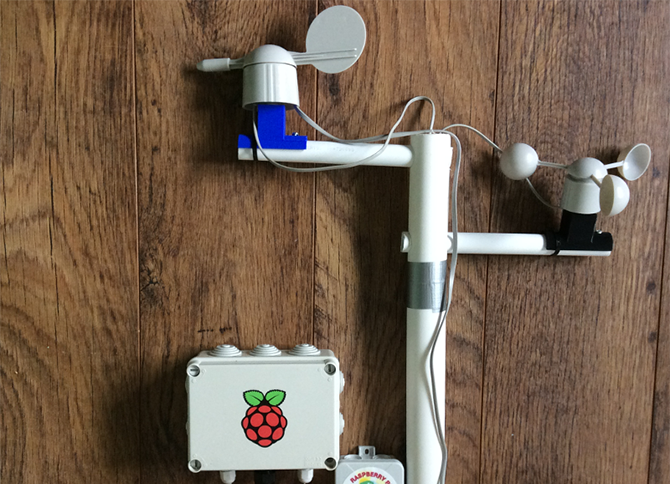 If your ambitions are a little closer to home and you’re interested in getting a clearer idea of the weather, the Pi can become the brains behind your own DIY garden weather station. You’ll need the right hardware for this kind of project, including various sensors, as well as a rain gauge and wind vane. Don’t forget to buy or build a waterproof case and fit the Pi with a solar panel. Once your station is built, you’ll need to be able to access the data. The Raspberry Pi Foundation recommends using Initial State, a platform for real-time data streaming. You can then use the data you record to monitor current weather conditions, as long as your Pi has an internet connection. Worried about dangerous drivers? You can protect yourself in an accident and record evidence with a car black box, thanks to the RoadApplePi project. A Bluetooth OBD-II adapter can log your car’s performance in real-time using the OBD-II port on your car. You can combine this with video evidence from the road using a USB camera. The onboard Wi-Fi of the Pi 3 or a Pi Zero W converts into a wireless access point. You can connect to this with a web app on your phone or laptop to access the onboard data if you don’t want to remove the Pi from your car. You’ll find the software you need for this project at the RoadApplePi GitHub repository. If you’re a birder (bird watcher, to you and me), you’ll want to see “birdlife” up close. With a Raspberry Pi and an IR camera add-on, you can build an infrared bird box camera for your garden. The NoIR camera add-on from the Raspberry Pi Foundation makes building a Pi bird box easy. Alongside the NoIR camera, you’ll need some infrared LEDs to give the camera light. You can attach these to the Pi’s GPIO pins directly with a 220-ohm resistor. For an independent build, you’ll need to power the Pi with a battery pack and solar panel. You’ll also need to fit the Pi to a suitably-sized bird box. Ever fancied building your own drone with its own autopilot navigation? You can with a Pi and the Navio2 add-on to guide it. The Navio2 is an extension HAT (Hardware Attached) add-on that sits on top of your Pi’s GPIO pins. It includes various sensors for altitude, acceleration, and orientation—everything a drone autopilot system needs to keep it airborne. You’ll also need the equipment to make your Pi fly. Think about a frame, propellers, motors, and a suitable battery supply and case. If you don’t want to completely DIY it, there are several assembly kits for the Navio2 to get your Pi in the air. You can navigate the ocean or the skies, or keep watch in your garden, all thanks to a Raspberry Pi. With a rugged case and the right accessories, the Raspberry Pi becomes the perfect computing powerhouse for any outdoor project you’re looking to build. If an outdoor project isn’t on your radar, consider some of these other awesome uses for a Raspberry Pi.